My first AVR programmer for the Atmega8 was a parallel port programmer: Slow, and available only for older computers with a parallel port. Not long after, Thomas Fischl designed his USBasp. This programmer is based on Thomas Fischl’s USBasp design and connects to your computer’s USB port. Not only is it quite compact, but the design is really elegent. 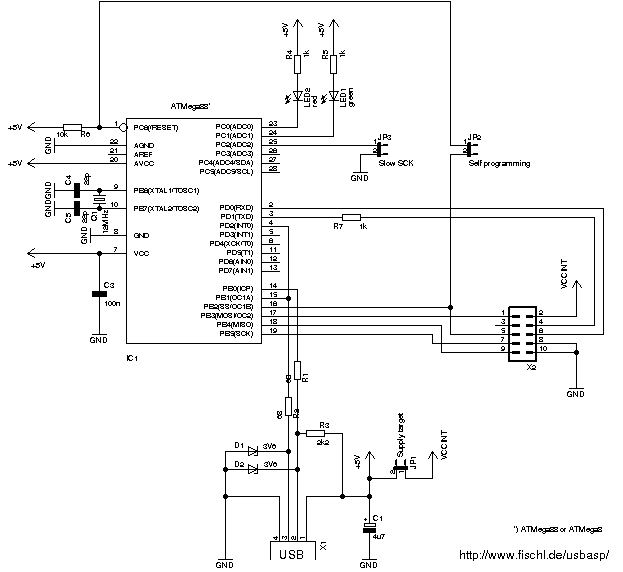 The USB interface is achieved by using an atmega processor and the rest is done in firmware. For those interested, the firmware source code can be downloaded from the USBasp website. Software controlled SCK option to support targets with low clock speed (< 1.5MHz) 10 pin ISP interface It has two leds to indicate power / operation mode. 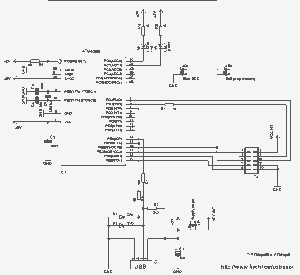 A 5V output can be used to directly supply voltage to the microcontroller it is connected to. The 5V output has overcurrent protection. Can be used with the following: AT89S51,AT89S52,AT89S8253,AT89S2051,AT89S4051, AT86RF401,AT90CAN32,AT90CAN64,AT90CAN128, AT90PWM2,AT90PWM2B,AT90PWM3,AT90PWM3B, AT90PWM81,AT90PWM216,AT90PWM316,AT90S1200, AT90S2313,AT90S2323,AT90S2343,AT90S4414,AT90S4433, AT90S4434,AT90S8515,AT90S8535,AT90SCR100H,AT90USB82, AT90USB162,AT90USB646,AT90USB647,AT90USB1286,AT90USB1287, ATmega8,ATmega8A,ATmega8U2,ATmega8HVA,ATmega16,ATmega16A, ATmega16HVA,ATmega16HVB,ATmega16M1,ATmega16U2,ATmega16U4, ATmega32,ATmega32A,ATmega32C1,ATmega32HVB,ATmega32M1,ATmega32U2, ATmega32U4,ATmega32U6,ATmega48,ATmega48P,ATmega48PA,ATmega64,ATmega64A, ATmega64C1,ATmega64M1,ATmega88,ATmega88P,ATmega88PA,ATmega103,ATmega128, ATmega128A,ATmega128RFA1,ATmega161,ATmega162,ATmega163,ATmega164P,ATmega164PA, ATmega165,ATmega165P,ATmega168,ATmega168P,ATmega168PA,ATmega169,ATmega169P, ATmega323,ATmega324,ATmega324PA,ATmega325,ATmega325P,ATmega328P,ATmega329, ATmega329P,ATmega406,ATmega640,ATmega644,ATmega644P,ATmega644PA,ATmega645, ATmega649,ATmega1280,ATmega1281,ATmega1284P,ATmega2560,ATmega2561,ATmega3250, ATmega3250P,ATmega3290,ATmega3290P,ATmega6450,ATmega6490,ATmega8515,ATmega8535, ATtiny10,ATtiny11,ATtiny12,ATtiny13,ATtiny13A,ATtiny15,ATtiny22,ATtiny24,ATtiny24A, ATtiny25,ATtiny26,ATtiny28,ATtiny43U,ATtiny44,ATtiny44A,ATtiny45,ATtiny48,ATtiny84, ATtiny85,ATtiny88,ATtiny167,ATtiny261,ATtiny261A,ATtiny461,ATtiny861,ATtiny861A,ATtiny2313,ATtiny2313. Credit goes to Thomas Fischl . Check his website. Thank you for sharing this! It is really interesting how you can create these kinds of programming controllers. Can I get the name of the person from whom you’ve ordered them? Im really newbie to program an IC such as atmega using avrdude. Please send me a file Step of step how to program an IC atmega using Avrdude (commant prompt), please help me….